I own a few routers. Most have cords, but I do have a router plane, too. Over time, I have come to use trim routers whenever possible. This past week while I was working on a bunch of mallet inserts, I made a discovery. The photo above is of a small jig I created to rout a handle area into half of the assembled insert. A small block (each milled to the exact thickness, length and width) is slide into the jig then a pattern bit, installed in one of my trim routers, clears away the balance of the waste – this is step three of many steps to complete the inserts. As each pair of routed pieces come out of the jig, I use a fractional dial caliper to measure the opening. In the past when I would make these pieces, I had measurements all over the place. I had to retract the bit depth every so often to keep the measurements within a usable guideline. It wasn’t clear what was going on. The router bit was not slipping – I have a phobia about this, so I make sure to install the bit and tighten the collet correctly. The adjustment was not a problem, but I had to keep an eye on things. This week, as I checked each pair coming out of the jig, there was no adjustments made. From start to finish, pieces came out right. Of course, this caused me to wonder. Then it hit me. The only difference between this time and the other times when I made sporadic adjustments was the trim router used. Bingo, that must be the problem. 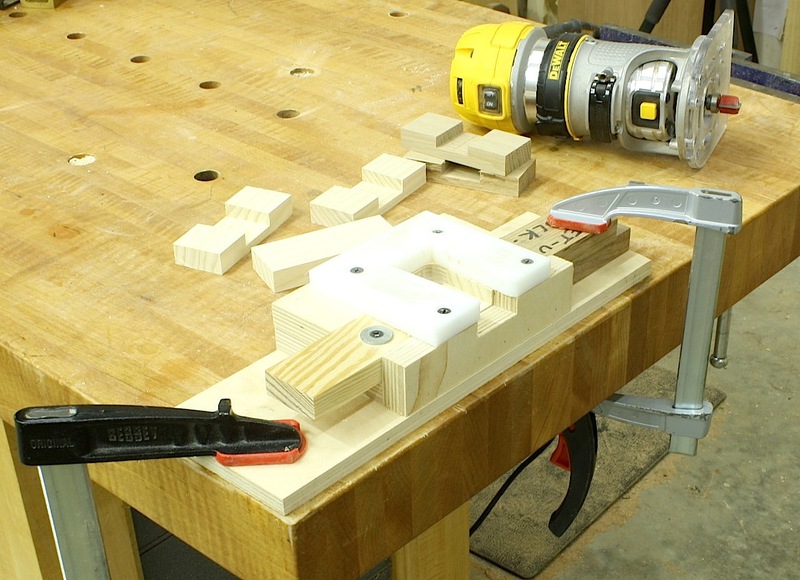 As shown in the opening photo, this time I use a DeWalt DWP611, which has become one of my favorite small routers. Previous times I used my Ridgid R2401. It seems my Ridgid trim router was slipping as I used it. Not the bit out of the collet as you may expect, but the motor was sliding down into the adjustable base. 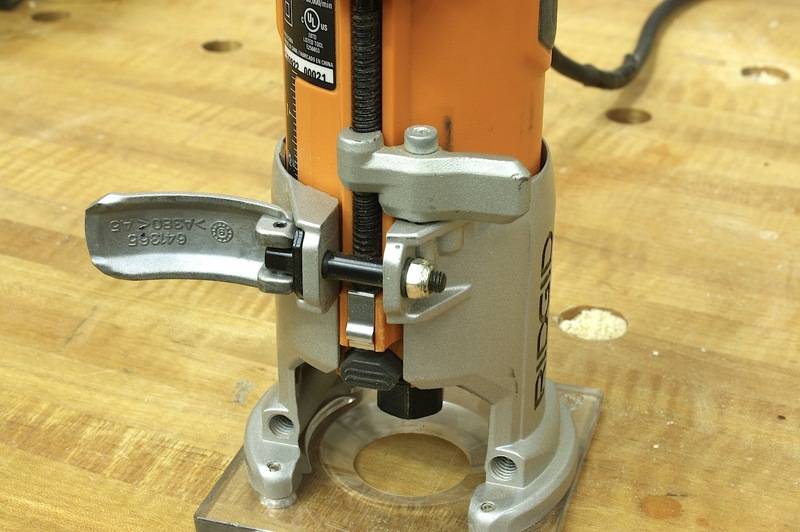 I have to admit that I have used the dog out of my Ridgid router, so I don’t want to give the wrong impression. 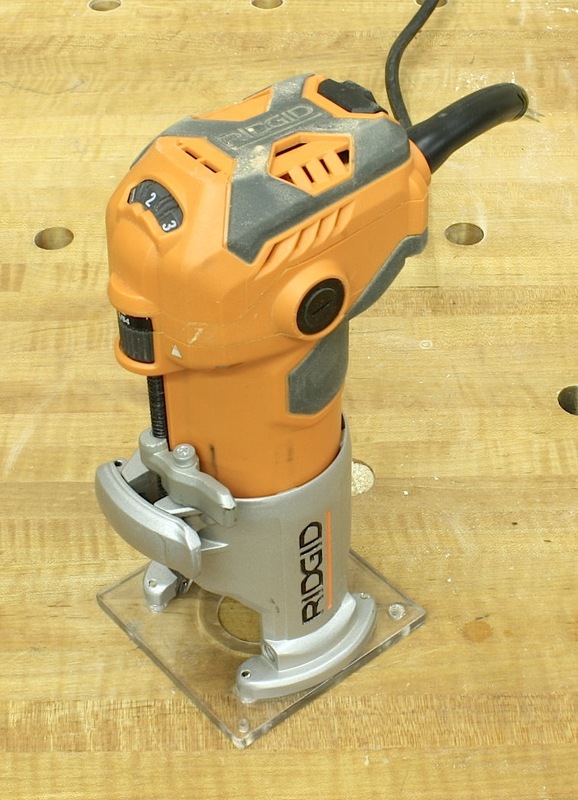 Until the DeWalt came along it’s the router I used for everything except pattern routing with a 3/4″-diameter bit. I use it so much that the bearings in my Ridgid are wearing out and the added vibration may be the cause of the unwanted slippage. There is a fix for my problem and this is why I am bringing this to your attention. Under the clamp lock there is a nut that tightens to increase the hold. I have adjusted that nut and should no longer see any creeping of the motor. It’s important to check your small power tools on occasion just as you check your woodworking machines. I am not going to toss my Ridgid. No, I plan to use this router for regular routing of moldings and the like instead of operations that have critical measurements required. In fact, at $89 from Home Depot, I may purchase another to have in reserve.